Observation - Gatekeeper - UK and Ireland. Description: Male Gatekeeper (a.k.a. Hedge Brown) on bramble near the entrance to Walton Hall's flower meadow. Numbers have grown rapidly over the week. 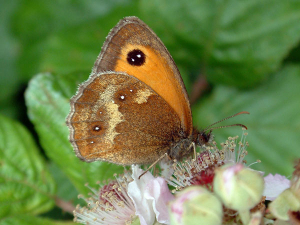 Male Gatekeeper (a.k.a. Hedge Brown) on bramble near the entrance to Walton Hall's flower meadow. Numbers have grown rapidly over the week.